The English poet John Milton was a champion of liberty. As a Protestant, he believed that the individual reader should interpret the Bible. He is chiefly famous for his epic (a long poem centered around a legendary hero) poem Paradise Lost and for his defense of uncensored (not checked for materials that may be harmful) publication. John Milton was born on December 9, 1608, in London, England. 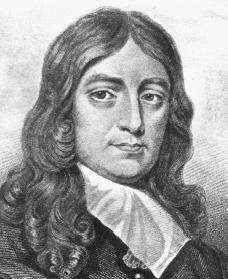 The future poet's father, John Milton, Sr., was a scrivener (a person who draws up deeds and wills). About 1600 he married Sara Jeffrey, the wealthy daughter of a merchant-tailor. Three of their children survived infancy: Anne, John, and Christopher. The young Milton was known for his devotion to his studies, and his early interest in poetry. From his father, who was an amateur composer (a writer of music), young John developed the love of music, which later spread through his poetry. After private tutoring, he entered St. Paul's School in about 1620. Admitted to Christ's College at the age of fifteen, he intended to become a priest in the Church of England. Because of a disagreement with his tutor, he was rusticated (temporarily expelled) in 1626. Back at Cambridge about April 1626, Milton was assigned a different tutor and resumed the study of logic, ethics, Greek, Latin, and Hebrew. He composed Latin poems and epigrams (short poems dealing pointedly with a single thought or event and often ending with a clever turn of thought). In 1628 Milton wrote his first major English poem, On the Death of a Fair Infant, Dying of the Cough, about the death of his sister's baby. A year later he wrote On the Morning of Christ's Nativity, celebrating the harmonizing power of divine love. lines with a specific rhyming pattern) in Italian, but he composed increasingly in English. After receiving bachelor of arts and master of arts degrees in 1629 and 1632, Milton lived in his family's suburban home in Hammersmith, England, and then at their country estate in Horton, Buckinghamshire, England. He continued studies in theology, history, mathematics, and literature, and participated in social and cultural life in London and the country. At this time he wrote sonnets, lyrics, and A Mask (better known as Comus; a mixture of song, dance, pageantry and poetry). Milton's themes were both particular and universal. In Lycidas (1637) he deals with why God allows the good to die young. In 1639, when he learned that a friend had died, he penned a moving Latin elegy (poetry for the dead), finding solace in Christian hope. By this time Milton had abandoned the idea of entering the ministry. He was, however, dedicated to making the Church of England more Protestant (non-Catholic). In 1638 and 1639 Milton toured France and Italy. His good looks, enthusiasm, and his ability to speak many languages helped him to enter polite society abroad. He intended also to go to Greece, but news of the growing political and religious crisis in England led him to return to London. It was by writing prose that Milton found opportunity to serve his God and country. There was a civil war in England that lasted from 1642 to 1648. King Charles I (1600–1649), who was Catholic, was opposed by a large number of his subjects, who were Puritan Protestants. King Charles was defeated and executed. In 1641 and 1642 Milton poured out tracts (leaflets) opposing the control over religion held by the Catholic bishops. He felt their powers were based on man-made traditions, self-interest, and a combination of ignorance, superstition, and deliberate lies. In 1644 Milton's Of Education dealt with another kind of domestic freedom: how to develop discipline, reasonableness, broad culture, all-round ability, and independence of judgment in schoolboys. The same year saw Areopagitica, his defense of man's right to free speech and discussion as the best means of advancing truth. As the civil war ended, Milton turned to condemning royal tyranny (the abuse of power). The Tenure of Kings and Magistrates (1649) argued that men have a natural right to freedom and that contracts they make with rulers are voluntary and can be ended. Soon after its publication Milton began a decade as the revolutionary government's secretary for foreign tongues. His chief duty was to translate state letters into Latin. For some years, however, Milton had been losing his eyesight, and by early 1652 he was totally blind. Milton had married Mary Powell in May 1642. In 1656, four years after his first wife's death, Milton married Kathrine Woodcock. Two years later she died after giving birth to a child, and he tenderly memorialized her in a sonnet, To my late departed Saint. In 1663 he married Elizabeth Minshell. Milton heroically persisted despite his misfortunes. During the crisis preceding restoration of the monarchy he wrote several tracts. In A Treatise of Civil Power (1659) he again urged toleration and separation of Church and state. Ready and Easy Way (1660) argued for preservation of a republic, a government in which citizens hold power and vote to elect officials as their representatives in the government. When Charles II, son of the executed Charles I, regained the throne in 1660, Milton was in danger for supporting the overthrow of the monarchy. Milton was harassed and imprisoned and several of his books were burned. However, he was included in a general pardon. Paradise Lost, the epic published in 1667, is inspired by the Bible story of the Creation, the fall of Adam and Eve, the rebellion of Satan against God, and Satan being cast out from heaven. In it Milton tried to convey some insight into God's wisdom and providence, but he did not intend it to be taken literally. Paradise Lost is generally regarded as the greatest epic poem in the English language. In 1671 its sequel, Paradise Regained, appeared in one volume with Samson Agonistes. Paradise Regained treats the rejection by Jesus of Satan's temptations. Its central point is that the true hero conquers not by force but by humility and faith in God. Samson Agonistes deals with the theme of temptation, dramatizing how the Hebrew strong man yielded to passion and seeming self-interest. In 1673 Milton reentered public controversy (open to dispute) with Of True Religion, a brief defense of Protestantism. Before his death he was planning to publish writings that appeared posthumously (after death): his Latin state papers (1676) and a short history of Moscovia (1682). In 1694 his nephew Edward Phillips published a life of his uncle with an English translation of the state papers. In the early nineteenth century the Latin manuscript of Milton's Christian Doctrine was discovered and translated (1825). In it he systematically set out to free the Scriptures from misinterpretation by discovering what the Bible itself said on such matters as fate, angels, and faith. Milton influenced many writers. Some, like John Dryden (1631–1700), admired his work and used it as the basis for their own writing. Others, including Alexander Pope (1688–1744), poked fun at it. Still others, such as Samuel Johnson (1709–1784), admitted the worth of Milton's work but disagreed with his religious and political views. In general, eighteenth-century poets praised him for possessing outstanding spiritual, intellectual, and moral worth. William Blake (1757–1827) and Percy Bysshe Shelley (1792–1822) praised his Satan as a romantic rebel. Samuel Taylor Coleridge (1772–1834) praised Milton's artistry and depth. In the 1920s, T. S. Eliot (1888–1965) criticized Milton's verse chiefly because of its influence. However, since about 1930, Milton has again been highly respected for his work. John Milton died in London on November 8, 1674. Lewalski, Barbara Kiefer. John Milton: A Critical Biography. Malden, MA: Blackwell Publishers, 2001. Parker, William Riley. Milton: A Biography. 2 vols. Oxford, England: Clarendon Press, 1968. Shawcross, John T. John Milton: The Self and the World. Lexington: University Press of Kentucky, 1993. Wilson, A. N. The Life of John Milton. New York: Oxford University Press, 1983. Very useful article especially for our new generation to know about an eminent poet and essayist.